Specialty coffee is at the heart of everything we do. Which is why the beans we source are specialty grade and some of the best in the world. Our buyers regularly visit the farms at origin and it’s the relationships we forge with these farmers that allows us to access this specialty grade coffee. Our buyers are well versed in every aspect of the coffee process – from where it’s grown to how it’s processed, fermented and milled. Coffee cherries are picked and sorted by hand, with only good cherries of the same amount of ripeness processed together. Some growers of specialty coffee even go as far as to sort the cherries by size. Apart from the region where the coffee is grown, the fermentation and processing method is one of the most important aspects of the entire process as it profoundly affects the flavour attributes of the final coffee product. This is why our buyers, who are also part of our roasting team, take a great deal of interest in the processing methods. 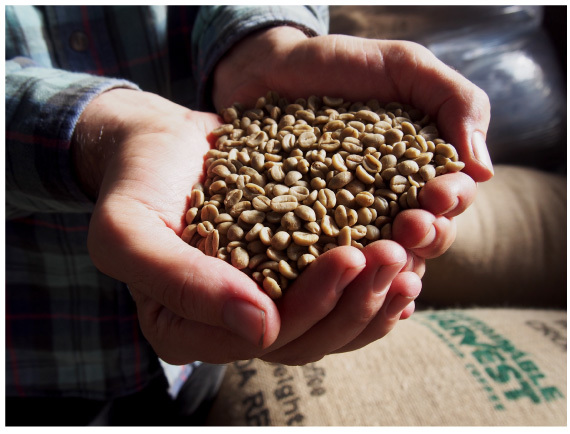 Naturally, the best coffee is made not only from the best quality coffee beans but also the freshest beans. Green beans, when stored in a clean, dry environment, can last around six months before the freshness and quality begins to deteriorate. That’s why we endeavour to have them roasted well within that time. As you can imagine, for busy roasteries such as ours, we are constantly receiving deliveries of green beans. From our years of roasting experience, we suggest that coffee is typically best consumed between two to 14 days after roasting.